Yes, I haven't been to Sookmyung University for Korean class since November 9. But knowing that today would be a cultural event after an hour of class (our last cultural event was a trip to the National Museum of Korea), coupled with the fact that I hadn't seen my friends since the jjimjilbang weekend, I went into Seoul. I met up with Anne for lunch beforehand, and then we found a big art shop in Hongdae so she could get some materials for her winter camp. When we got to class a little late, we found out that the Level 1 test was today - not next week. There was absolutely no reason for me to take it; I had only been to the first 2 of 8 classes in the level. So the teacher said of course it was okay to sit out on the test, but to stay for the cultural event afterwards. Yay! So after the 15:00-16:00 class, we were sorted into different classrooms for some cultural fun and games. Our first event was yunnori (also "yut-nori"), a Korean game often played on the Korean New Year. 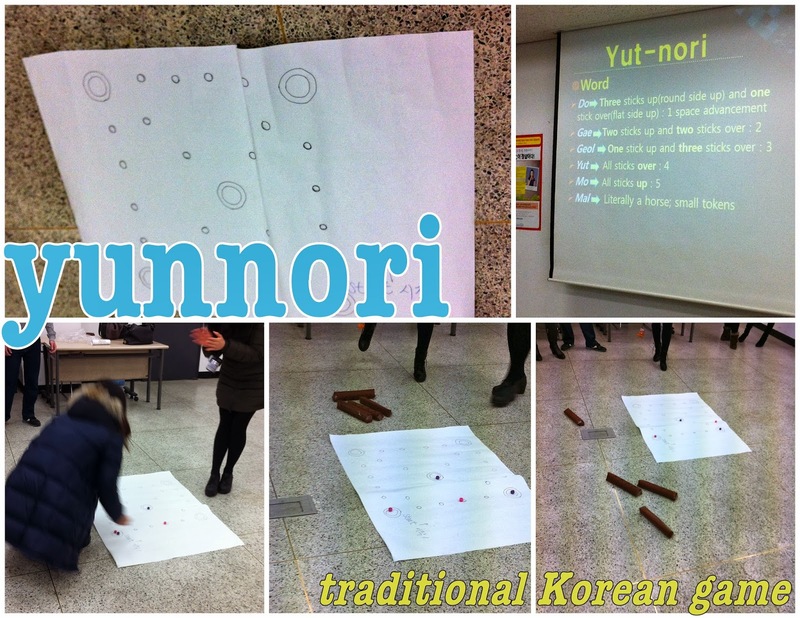 My 6th graders had a reading about yunnori in one of their last units ("How do you say ~ in Korean? ", that lesson), so I was excited to play for real. It's a simple game that involves throwing four sticks into the air to determine how many spaces you can move on the board. Our level one class won both games! Next we made some origami hanbok, which is the name of traditional Korean clothing (another word I had learned during that same lesson with my 6th graders). 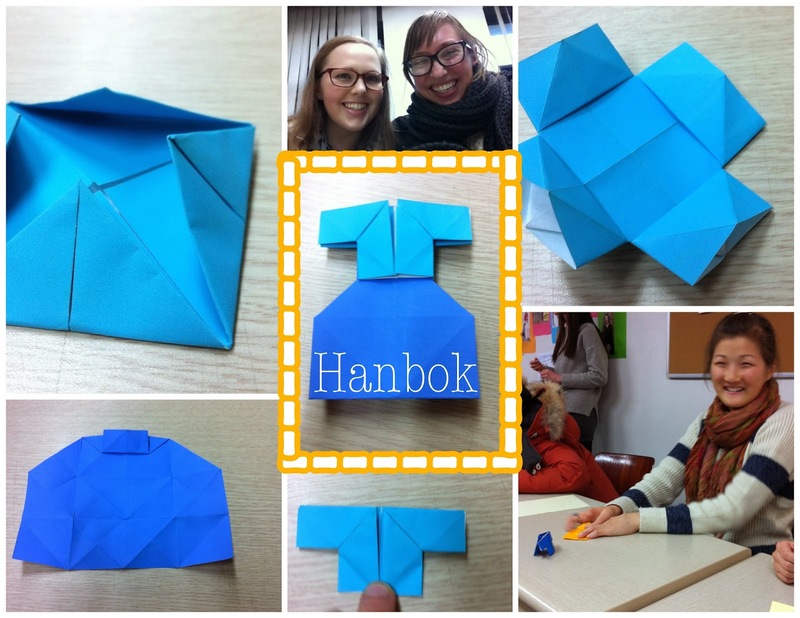 Then we wrote New Year's letters, and we were supposed to glue the origami hanbok to the letter (I didn't have room). 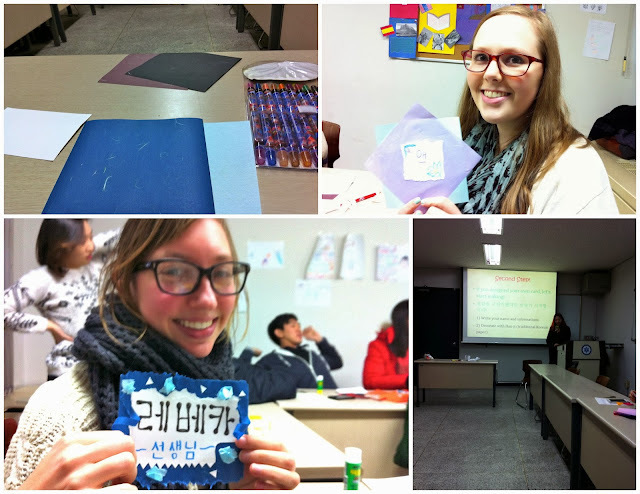 In the final room we made Korean name cards (business cards?). We were supposed to write our name, occupation, and other contact information if you want, and then decorate it with the handmade Korean paper they had available. The food afterwards was a lovely surprise. The volunteers had made 주먹밥 for us (one for each of us! ), which they called rice balls. 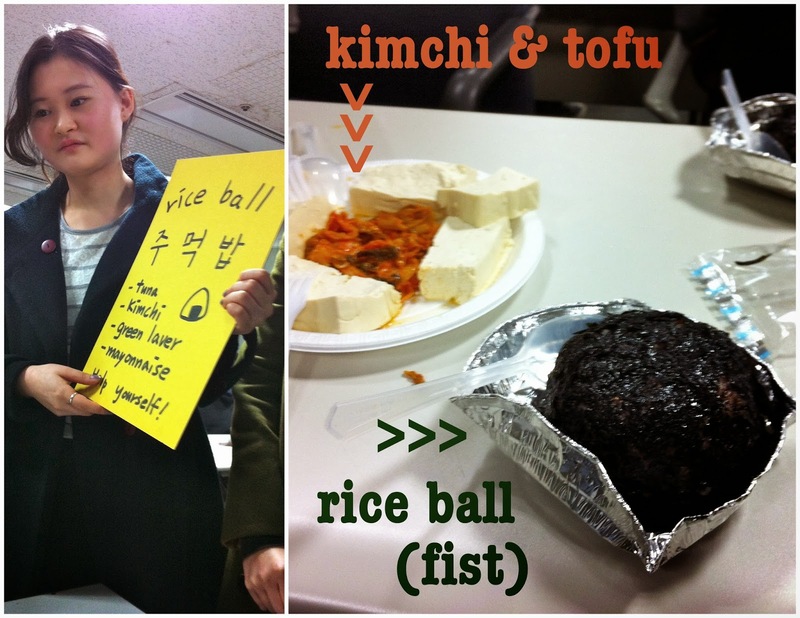 They taught us that the first part of that word, 주먹, means "fist", and then 밥 is "rice", so it's like a fist of rice. Apparently it's a common eat for university students, since it's quick and cheap. There was tuna and kimchi inside, and the rice ball was wrapped in a sheet of dried seaweed. It was good and filling, but I could barely eat half of one since I was still full from lunch.